By-Laws of Holy Sepulchre Commandery, No. 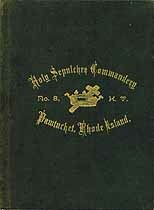 8, Knights Templar, Pawtucket, R. I. Established Dec. 9 A. D. 1847. Chartered Sept. 25 A. D. 1849. By-Laws Revised 1890. Names in this online transcription include Abbott, Adams, Alden, Aldrich, Allen, Allenson, Andrew, Armstrong, Arnold, Aumann, Babbitt, Bacon, Bancroft, Barber, Barclay, Barney, Bates, Batty, Beers, Belfield, Benedict, Beswick, Billington, Bishop, Blacklock, Blair, Bliss, Boardman, Booth, Bosworth, Bowen, Bradshaw, Bray, Briggs, Broome, Brown, Browne, Bryant, Bucklin, Bullard, Bullock, Burnham, Buxton, Byron, Capron, Card, Carpenter, Chace, Chamberlain, Chambers, Chantler, Chase, Chatterton, Chickering, Church, Claflin, Clapp, Clark, Clarkson, Cobb, Cole, Collins, Colwell, Comstock, Cooke, Cottrell, Crandall, Crawford, Crocker, Crowell, Cudworth, Cummings, Curtis, Daniels, Darling, Dary, Davis, Dawber, Day, Dean, Delany, Dexter, Dispeau, Draper, Drowne, Duckworth, Duxbury, Earle, Eastwood, Ellsbree, Emerson, Emery, England, Entwistle, Evans, Fairbrother, Fales, Farnsworth, Field, Fifield, Fish, Fisk, Flagg, Foster, Fowler, Fraser, Freeman, French, Gammon, Gay, Gildard, Gill, Gilmore, Girvin, Goddard, Goff, Goldsworthy, Gosling, Greaves, Greene, Greenhalgh, Gregg, Gridley, Griffin, Hall, Halliday, Hammond, Harley, Harrison, Haskins, Havens, Hayward, Henry, Hibbert, Hicks, Highland, Hill, Hilton, Himes, Hindley, Hiscox, Holmes, Hornby, Horton, Hough, Hull, Humes, Hunter, Hutchison, Ingraham, Jackson, Jencks, Jenks, Jerauld, Johnson, Jones, Jordan, Kent, Kenyon, King, Kirk, Ladd, Lapham, Latham, Lavery, Lawson, Le Favour, Le Valley, Lent, Lewis, Lindsay, Little, Logee, Lomas, Lougee, Lowden, Lumb, Luther, MacAllen, Manchester, Mann, Mason, Mathews, Mathewson, McElroy, McGregor, McIntyre, McKelvey, McMahon, McManus, Merrill, Merry, Miller, Miner, Morton, Mowry, Newell, Nickerson, Nisbet, Nye, Ogden, Oldham, Olney, Orr, Ott, Parker, Patt, Patton, Payne, Peck, Perkins, Perrin, Perry, Pervear, Phillips, Pierce, Potter, Power, Pratt, Pray, Prescott, Preston, Pullen, Quamby, Randall, Razee, Read, Rex, Reynolds, Rice, Richardson, Riley, Robbins, Roberts, Robertson, Robinson, Rogers, Ross, Sager, Salisbury, Saunders, Scott, Seamans, Shepard, Sherman, Shippee, Shove, Sibley, Simons, Skinner, Slade, Slocomb, Smith, Spaulding, Spencer, Spofford, Spring, Stanley, Stearns, Stillman, Street, Sweet, Taft, Talpey, Tanner, Taylor, Thatcher, Thayer, Thomas, Thornton, Thurber, Tiepke, Tingley, Towne, Trescott, Tyler, Tyson, Utton, Walker, Warburton, Warland, Warner, Washburn, Waterman, Watson, Weaver, Webb, Weeden, Welcome, Wheaton, Whipple, White, Whittle, Whitworth, Wilbour, Wilbur, Wilcox, Wilkinson, Williams, Wilmarth, Wilson, Winchester, Witzkie, Wood, Woolley, Worsley. The Genealogy Today catalog number for this item is 13355. When inquiring about the information in this resource, please mention the catalog number.